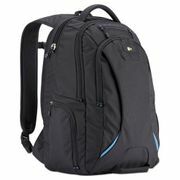 Case Logic 15.6" Checkpoint Friendly Backpack, 2.76" x 13.39" x 19.69", Polyester, Black. •Designed to be checkpoint friendly so your laptop does not need to be removed when passing through airport security. •Dedicated compartments that fit both a 15.6" laptop and an iPad® or tablet. •Spacious middle compartment stores folders, books, headphones or extra clothing. •Elevated zippered pockets provide cord, smartphone and small accessory storage so they do not disappear into the bottom of the bag. •Top loading pocket keeps smartphone easily accessible while plush lining prevents it from being crushed or scratched. 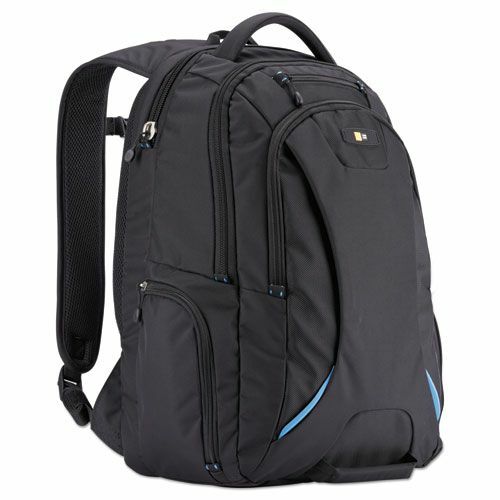 •Front compartment features storage pockets for small electronics and pens and a zippered pocket for keys or passport, plus additional space for a power brick. •Lumbar padding doubles as a pocket for small items of value. •Thick foam padding with breathable mesh covers pressure points in the shoulder blades and lumbar area to create airflow channels for ultimate comfort. •Adjustable sternum strap provides security and comfort.